I love when a dish is labeled as “breakfast” but in reality, it’s a yummy treat suitable for dessert. 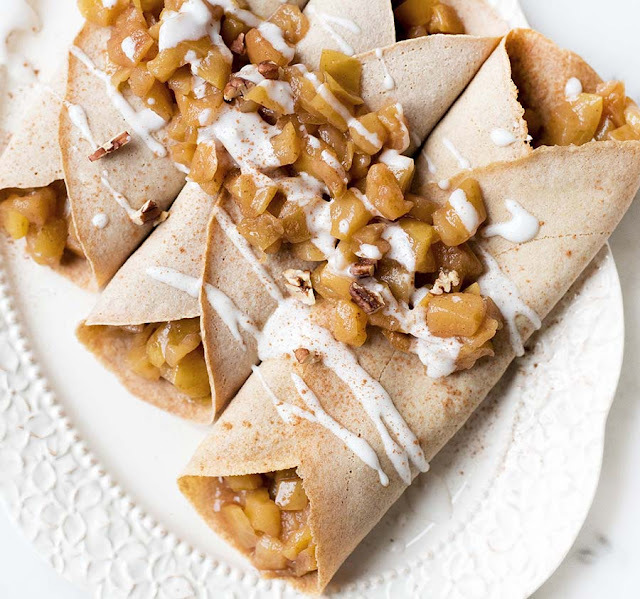 I’m not saying these apple pie crepes could be a dessert but I’m also not saying they can’t be either. Listen, I’ll eat this “breakfast” dish every morning if you know what I mean! I think crepes are often overshadowed by oatmeal, pancakes, waffles, etc., and I’m not quite sure why. 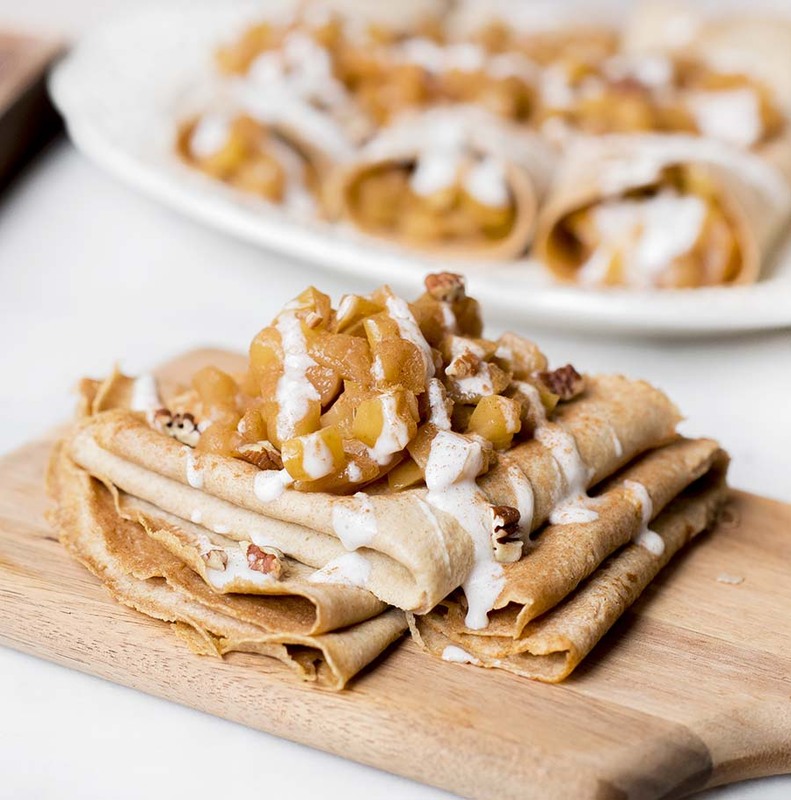 They are super easy to make, only require a few, simple ingredients, and can be filled with a variety of foods, from chocolate to lemon curd, fruits, and even savory ingredients! This recipe is free of dairy, eggs, refined sugars, refined oils, peanuts, artificial flavors & artificial colors. 1. Start with the apple filling by combining all filling ingredients in a medium to large saucepan. Place saucepan on the stove over medium heat and bring to a low simmer. Cook until apples soften, stirring occasionally, about 30-40 minutes. 2. While apples are cooking, begin making the crepes by adding the eggs, milk, and water to large mixing bowl. Whisk for about 1-2 minutes, or until mixed well and lightly frothy. 3. Add in flour and cinnamon and whisk again for 1-2 minutes. 4. Heat a round pan on the stovetop over low heat. Coat the pan with coconut oil then pour about ¼ cup crepe batter into pan. Swirl the pan to evenly disperse the batter then place it back over the heat. 5. Cook about 2-4 minutes, or until the surface of crepe is set. Flip and cook another 1-3 minutes, until lightly golden brown. * If you prefer soft crepes, cook 1-2 minutes per side. For a more classic crepe, cook a bit longer or until golden brown on both sides. 6. 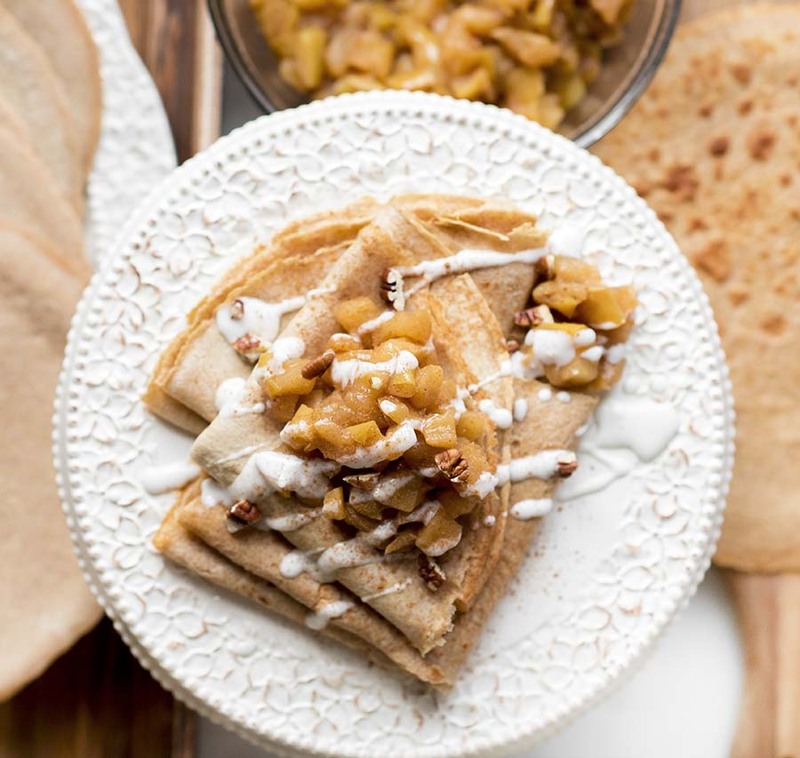 Lay cooked crepes on a plate or flat surface until ready to eat. 7. Spoon solid portion of coconut cream into a mixing bowl. Beat on high speed until smooth and creamy. 8. 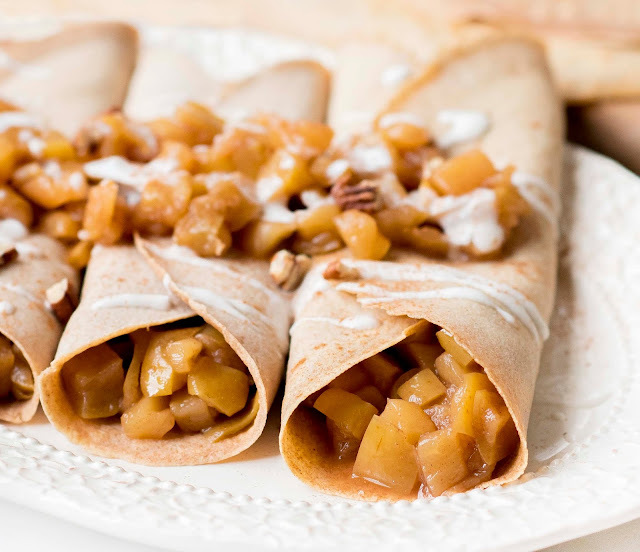 Assemble the crepes by evenly filling each with apple pie mix and topping with whipped coconut cream. Enjoy! Use any full-fat milk of choice. Cow, coconut, cashew, or almond milk are all good choices. I recommend placing the can of coconut cream in the fridge the night before you make the recipe. It helps harden the solid portions, which you’ll use for the cream. It's a great recipe. Hope to see more content from you this year. Good luck!